The academy was full of energy on Tuesday morning, with students and tutors alike excited for what we like to call ‘Power Hour’. Power Hour happens at the beginning of each month, here at the academy. Students are given demos by industry professionals, or talks on creative industries, wellbeing and other insightful topics. For the first power hour of the year, our talented hairdressing, barbering and makeup tutors exhibited their skills at a number of varied stations, providing an ample opportunity for students to ask questions and get stuck in themselves. 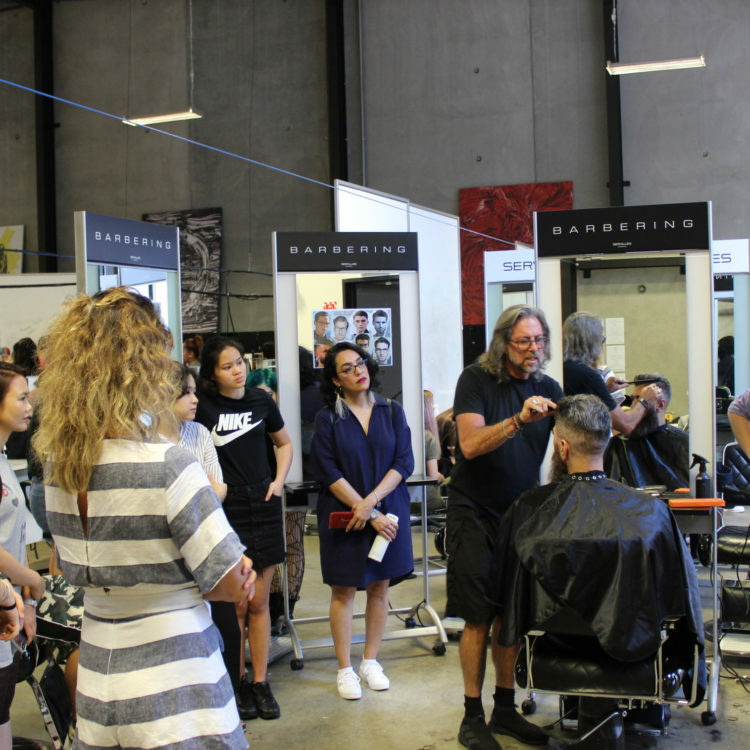 We were thrilled to have the man himself (Paul Serville) give our students a top-class barbering demo. Paul’s model for the morning was our barbering tutor, Leon. Paul’s 50 years in the industry shone through as he engaged the students with his scissor, clipper and styling abilities. “The industry is changing and it’s good to learn the new trends. It’s awesome how we’re able to get so many demos from tutors and people in the industry who are from different backgrounds and have lots of experience.” – Keegan Dufty, Barber Skills student. Another station was led by the academy’s creative director and hairdressing tutor, Alecia. This area was to display the capabilities of the revolutionary tool ‘The Imprinter’, created by Angelo Seminara (Davines’ International Creative Director). With designs inspired by nature, The Imprinter enables colour application and patterns like never before, creating unique hair looks. In total, there were three models who dazzled with their new hair and best of all, the students loved trying the tool themselves. Makeup tutor Jordan and hairdressing tutor Erin did a joint station, showcasing their talents to create a complete look. Erin worked on her model’s colour the day prior and explains, “I took my model from dark brown virgin hair to a gorgeous, cool natural bleach and tone using Davines’ Century of Light (Progress and Tolerance) then double toned with 10,21 then 10,21 9,01 and 0,21.” For the demo, Erin gave her model a “self-cut” fringe and edgy bob. Jordan then went in to create a grungy, glossy eye look to tie the complete look together. For another look, tutors Kellie and Nick worked on two of our students to create bold makeup looks, with textured and soft, wavy hair. Hair tutors Nancy and Helen also worked on a look consisting of a bold, magenta eye with a dark bob. The final station was bridal inspired, which was a collaboration by hairdressing tutor Bex and makeup tutor Kim. The end result was a bold eye, with beautiful soft curls, topped with a floral headpiece. Our students loved the morning and were able to gain some new technical ability across all programmes. To see photos from the morning, click on the Photo Gallery button below.